Kyle Greenwood (born March 1, 1987) is a Canadian professional wrestler and actor better known by the ring name Kyle O'Reilly. He is signed to WWE, performing on its NXT brand. He is a member of The Undisputed Era. He is best known for his time with Ring of Honor (ROH). He also worked for New Japan Pro Wrestling and competed for several independent promotions, most notably Pro Wrestling Guerrilla. O’Reilly is a one-time ROH World Champion, three-time ROH World Tag Team Champion alongside Bobby Fish as reDRagon, while in PWG he is a one-time World Champion and the winner of the promotion's 2013 Battle of Los Angeles. O'Reilly appeared at NWA: Extreme Canadian Championship Wrestling (ECCW)'s television tapings on December 23, 2005, where he and Tony Tisoy lost to Wrathchild and Killswitch. In January 2006, O'Reilly was in the main event of ECCW's tenth anniversary show, teaming with Fast Freddy Funk and Kurt Sterling to defeat Michelle Starr, Johnny Canuck and Vance Nevada. O'Reilly graduated from ECCW's House of Pain Wrestling School on May 29, 2006. At the graduation show, O'Reilly pinned his trainer Aaron Idol. He continued to appear in ECCW throughout the remainder of 2006 and early 2007. In March 2007, O'Reilly began a feud with Sid Sylum, losing to him in a "European Rounds" match on March 2, before he teamed with Veronika Vice to defeat Sylum and Nikki Matthews in a mixed tag team match the following night. On March 30, O'Reilly defeated Sylum in an "I Quit" match to end the feud. In June 2007, O'Reilly entered the Pacific Cup tournament, where he faced Tony Kozina and Scotty Mac in the final and was victorious. On July 21, O'Reilly defeated Ice to win the NWA Canadian Junior Heavyweight Championship. He lost the championship back to Ice just six days later. The following month, on August 18, O'Reilly once again defeated Ice to win the NWA Canadian Junior Heavyweight Championship for the second time, but lost it back to Ice again the same day. In a rematch on August 24, the match ended in a double pin, causing the championship to be vacated. As a result, O'Reilly and Ice competed in a best of five series to determine the new champion. O'Reilly defeated Ice in the first match of the series on November 16, but Ice won the second to tie the series at one all. O'Reilly won the third match, but Ice won the fourth, a street fight. In the rubber match on December 28, O'Reilly defeated Ice in a Last Man Standing match to win the championship for the third time. In 2008, O'Reilly attempted to win the Pacific Cup for the second year in a row, but was unsuccessful. He defeated Halo and Azeem en route to the final, a three-way elimination match against Billy Suede and El Phantasmo, but was the first man eliminated. In April 2009, O'Reilly and 19 other wrestlers took part in ECCW's Wrestling With Hunger marathon show, where he wrestled almost 40 matches in 72 hours to raise money for a local food bank. On March 19, 2010, O'Reilly competed in a three-way match for the NWA Canadian Heavyweight Championship against champion Billy Suede and Sylum. In April, O'Reilly defeated Rick Sterling at Title vs. Title. He entered the Pacific Cup tournament again on June 6, defeating Azeem and Suede en route to the final where he lost to Artemis Spencer. At To Hell and Back on June 25, O'Reilly wrestled twice in one night, defeating Ice before losing to Sylum in a match for the NWA Canadian Heavyweight Championship. The following night, O'Reilly teamed with El Phantasmo to face Pop Culture in a two out of three falls match, which Pop Culture won, two falls to one. On July 10, O'Reilly lost to Tony Baroni. O'Reilly returned to ECCW to compete in the Pacific Cup tournaments in 2011 and 2014. O'Reilly returned to ECCW on January 14, 2017 for Ballroom Brawl 7 where he defeated El Phantasmo for the ECCW Championship. He vacated the title immediately after winning to ensure ECCW would have a fighting champion as he figured out his future. O'Reilly made his Full Impact Pro (FIP) debut at the In Full Force show on May 30, 2008, where he lost to Damien Wayne. He appeared again for FIP the following night at Southern Justice 2008 wrestling Johnny DeBall. The match ended in a no contest when Davey Richards attacked both competitors. He returned to FIP in November 2009, appearing at the Jeff Peterson Memorial Cup, Night 1 where he teamed with Tony Kozina in a Tag Team Rumble which was won by Bumz R' Us. On January 16, 2010, O'Reilly appeared at the Evolve promotion's inaugural show, where he defeated Bobby Fish. At Evolve 2: Hero vs. Hidaka, O'Reilly defeated Hallowicked, who a replacement for an injured TJP. O'Reilly suffered his first loss in the promotion at Evolve 3: Rise or Fall, when he lost to TJP. He lost his second match to Ricochet at Evolve 5: Danielson vs. Sawa, giving him a record of two wins and two losses. O'Reilly appeared at Dragon Gate USA (DGUSA)'s Open the Freedom Gate pay-per-view taping on November 28, 2009 on the pre-show, where he defeated Adam Cole. At the DGUSA Fearless pay-per-view, O'Reilly won a six-way match on the pre-show, before he accompanied Davey Richards to the ring for his match. On September 26, 2010, O'Reilly participated in six pack challenge, which was won by Brodie Lee at a DGUSA in Milwaukee. On August 28, 2010, O'Reilly competed in Chikara's Young Lions Cup tournament, but lost to Adam Cole in the quarter-finals. On May 26, 2017 at WCPW Pro Wrestling World Cup - Canadian Qualifying Round O'Reilly defeated Tyson Dux in the first round of the Canada Leg. O'Reilly was defeated by Mike Bailey in the Semi-Finals. O'Reilly made his Ring of Honor (ROH) debut in 2009. On November 13, 2009, Tony Kozina defeated O'Reilly. On the December 21, 2009 episode of Ring of Honor Wrestling, taped on November 5, O'Reilly lost to Chris Hero. At the February 5, 2010 tapings on Ring of Honor Wrestling, O'Reilly defeated Tony Kozina. On April 23, 2010, in Dayton, Ohio, O'Reilly defeated Sampson. On September 10, 2010, O'Reilly was defeated by ROH World Champion Austin Aries. Three days later, ROH announced they had signed O'Reilly to a contract with the company. O'Reilly then began to ally himself with fellow ROH newcomer Adam Cole, with the pair forming a tag team. At the October 2 Ring of Honor Wrestling tapings they defeated the team of Grizzly Redwood and Mike Sydal. They lost to Steve Corino and Kevin Steen on October 15, and the All Night Express of Kenny King and Rhett Titus at a show on October 16. They defeated the Bravado Brothers (Lance and Harlem) on the November 8 episode of Ring of Honor Wrestling. On November 12, O'Reilly participated in the 2010 edition of the Survival of the Fittest tournament, but was eliminated by Kevin Steen in the first round. The following night in Toronto, O'Reilly and Cole defeated the Bravado Brothers. O'Reilly made his ROH pay-per-view debut on December 18 at Final Battle 2010, where he and Cole were defeated by the All Night Express (Rhett Titus and Kenny King). On April 1 and 2 at Chapter One and Two of Honor Takes Center Stage, O'Reilly and Cole faced The Briscoe Brothers (Jay and Mark) and The Kings of Wrestling (Chris Hero and Claudio Castagnoli) in two losing efforts, despite putting on strong performances. On July 8, O'Reilly and Cole defeated the Bravado Brothers to earn a future shot at the ROH World Tag Team Championship. On July 25, ROH announced that O'Reilly had re-signed with the promotion. At the August 13 tapings of Ring of Honor Wrestling, the tag team of O'Reilly and Cole was named Future Shock. At the January 7, 2012, tapings of Ring of Honor Wrestling, Future Shock disbanded and O'Reilly formed a new tag team named Team Ambition with Davey Richards, opposite Adam Cole and Eddie Edwards. Outside of ROH, the team also came to include Tony Kozina. On March 4 at the 10th Anniversary Show, Team Ambition was defeated in a main event tag team match by Cole and Edwards. On March 31 at Showdown in the Sun, O'Reilly faced Cole and defeated him using an underhanded tactic. On June 24 at Best in the World 2012: Hostage Crisis, O'Reilly was defeated by Cole in a "Hybrid Rules" match. Afterward, O'Reilly slapped Cole as he tried to make peace with his former partner and later announced that he was now going after Richards, cementing his heel turn. On December 16 at Final Battle 2012: Doomsday, O'Reilly and Bobby Fish (known as reDRagon) faced the reformed American Wolves (Davey Richards and Eddie Edwards) in a losing effort. At the following iPPV, 11th Anniversary Show on March 2, 2013, O'Reilly and Fish defeated the Briscoe Brothers for the ROH World Tag Team Championship. The same month, they successfully defended the championship against Alabama Attitude (Corey Hollis and Mike Posey), before retaining it at Best in the World 2013 in June in a three-way match against the C & C Wrestle Factory (Caprice Coleman and Cedric Alexander) and S.C.U.M. (Cliff Compton and Rhett Titus). They lost the title to the Forever Hooligans (Alex Koslov and Rocky Romero) on July 27, but regained the title from the American Wolves on August 17. Over the next several months reDRagon successfully defended the championship against teams including the C & C Wrestle Factory, the Forever Hooligans, and Jay Lethal and Michael Elgin. They retained the championship against Outlaw, Inc. (Homicide and Eddie Kingston) at Final Battle 2013 in December and Adrenaline Rush (ACH and TaDarius Thomas) at the 12th Anniversary Show in February 2014. On March 8, 2014, reDRagon lost the title to The Young Bucks. ReDRagon regained the tag team championship from The Young Bucks on May 17, at the ROH and New Japan Pro Wrestling (NJPW) co-promoted pay-per-view War of the Worlds. They successfully defended the championship against The Briscoe Brothers on June 7 and against Christopher Daniels and Frankie Kazarian at ROH's first live pay-per-view Best in the World 2014 on June 22. On November 23, reDRagon defeated ACH and Matt Sydal, The Addiction (Daniels and Kazarian), and The Briscoes to retain the ROH World Tag Team Championship and win the Tag Wars tournament. They followed up their victory with successful title defenses against the Time Splitters (Alex Shelley and Kushida) at Final Battle 2014, The Young Bucks in March 2015 at ROH's 13th Anniversary Show, and The Kingdom (Michael Bennett and Matt Taven) at Supercard of Honor IX. O'Reilly and Fish lost the tag team title to The Addiction at the Ring of Honor Wrestling tapings on April 4. On September 18, 2015, at All Star Extravaganza VII, O'Reilly received a shot at the ROH World Championship, but was defeated when Adam Cole turned on him. On August 19, 2016, at Death Before Dishonor XIV, O'Reilly made his return and surprisingly interrupting Cole's victory celebration as the two-time ROH World Champion by attacking him, thus reigniting their feud. On December 2 at Final Battle, O'Reilly defeated Cole to win the ROH World Championship for the first time. On December 31, O'Reilly's ROH contract expired. He was said to be reviewing his future options and working for ROH on a per date agreement until he made a decision. On January 4, 2017, O'Reilly lost the ROH World Championship back to Cole at NJPW's Wrestle Kingdom 11 in Tokyo Dome. On January 11, 2017, O'Reilly was removed from the ROH roster page and pulled from all upcoming ROH events, indicating his contract with Ring of Honor had expired, ending his 8-year tenure with the company. On October 22, 2011, O'Reilly debuted in Pro Wrestling Guerrilla alongside regular tag team partner Adam Cole as Future Shock. They unsuccessfully challenged The Young Bucks (Matt and Nick Jackson) for the PWG World Tag Team Championship. At Fear on December 10, Future Shock were defeated by the RockNES Monsters (Johnny Goodtime and Johnny Yuma). On April 21, 2012, Future Shock entered the annual Dynamite Duumvirate Tag Team Title Tournament (DDT4), where they made it to the semifinals, before losing to the eventual tournament winners, the Super Smash Bros. (Player Uno and Stupefied). On July 21 at PWG's ninth anniversary event, Future Shock unsuccessfully challenged the Super Smash Bros. for the PWG World Tag Team Championship in a three-way ladder match, which also included The Young Bucks. On January 12, 2013, Future Shock entered the 2013 Dynamite Duumvirate Tag Team Title Tournament. After defeating the DojoBros (Eddie Edwards and Roderick Strong) in their first round match, the team was eliminated from the tournament in the semifinals by El Generico and Kevin Steen. On August 30, O'Reilly entered the 2013 Battle of Los Angeles, defeating Trent? in his first round match. The following day, O'Reilly first defeated ACH in the second round, then Drake Younger in the semifinals and finally Michael Elgin in the finals to win the 2013 Battle of Los Angeles and become the number one contender to the PWG World Championship, held by his former Future Shock partner Adam Cole. O'Reilly received his title shot on October 19, but was defeated by Cole, following interference from Kevin Steen and The Young Bucks. O'Reilly received a rematch for the PWG World Championship in a "Knockout or Submission Only" match on May 23, 2014, and defeated Cole to become the new champion. In August, O'Reilly made it to the semifinals of the 2014 Battle of Los Angeles, but was forced to withdraw from the match after suffering a storyline injury at the hands of Roderick Strong. On December 12, O'Reilly successfully defended the PWG World Championship against the 2014 Battle of Los Angeles winner Ricochet, only to lose it to Strong in an impromptu Guerrilla Warfare match immediately afterward. On March 4, 2016, O’Reilly defeated Marty Scurll and the next night reDRagon lost to The Young Bucks failing to the tag titles. on July 29, O’Reilly received a PWG World Title match against Zack Sabre Jr. but lost. on September 2, reDRagon and Dalton Castle lost a six-man tag to Mount Rushmore 2.0 (Adam Cole, Matt Jackson and Nick Jackson). on September 3, O’Reilly defeated Matthew Riddle in the 1st round of a tournament but lost in the quarter-finals to Mark Haskins. on December 16, reDRagon defeated Death By Elbow (Chris Hero and JT Dunn). on April 21, 2017, O'Reilly lost to Michael Elgin. then on May 19, reDRagon lost to The Chosen Bros (Jeff Cobb and Matthew Riddle). Through ROH's relationship with NJPW, reDRagon made an appearance for the Japanese promotion on August 10, unsuccessfully challenging Time Splitters (Alex Shelley and Kushida) for the IWGP Junior Heavyweight Tag Team Championship. reDRagon returned to NJPW on October 25 to take part in the 2014 Super Jr. Tag Tournament. On November 3, reDRagon defeated The Young Bucks in the finals to win the tournament. Five days later at Power Struggle, reDRagon defeated Time Splitters in a rematch to become the new IWGP Junior Heavyweight Tag Team Champions. They made their first successful title defense on January 4, 2015, at Wrestle Kingdom 9 in Tokyo Dome, in a four-way match against Forever Hooligans, Time Splitters and The Young Bucks. On February 11 at The New Beginning in Osaka, reDRagon lost the title to The Young Bucks in a three-way match, also involving Time Splitters. reDRagon returned to NJPW on May 3 at Wrestling Dontaku 2015, where they unsuccessfully challenged for the IWGP Junior Heavyweight Tag Team Championship in a three-way match with Roppongi Vice (Beretta and Rocky Romero) and The Young Bucks. Later that month, O'Reilly entered the 2015 Best of the Super Juniors. Finishing with a record of six wins and one loss, he won his block and advanced to the finals of the tournament. On June 7, O'Reilly was defeated in the finals of the tournament by Kushida. Following the tournament, reDRagon received a rematch for the IWGP Junior Heavyweight Tag Team Championship in a three-way match, also involving Roppongi Vice, but were again defeated by The Young Bucks on July 5 at Dominion 7.5 in Osaka-jo Hall. On August 16, reDRagon defeated The Young Bucks to win the IWGP Junior Heavyweight Tag Team Championship for the second time. They lost the title back to The Young Bucks in a four-way match that also included Roppongi Vice and Matt Sydal and Ricochet on January 4, 2016, at Wrestle Kingdom 10 in Tokyo Dome. On October 10 at King of Pro-Wrestling, O'Reilly received his first singles title shot in NJPW, when he unsuccessfully challenged Katsuyori Shibata for the NEVER Openweight Championship.at Wrestle Kingdom 11, O'Reilly lost the ROH World Championship to Adam Cole. O'Reilly made his debut for NXT at the July 12, 2017, television tapings of NXT, which aired on August 2, losing to Aleister Black. At NXT TakeOver: Brooklyn III, O'Reilly along with Bobby Fish attacked Sanity after they won the NXT Tag Team Championship against The Authors of Pain. They then attacked newly crowned NXT Champion Drew McIntyre later that night, being joined by Adam Cole, turning heel in the process. The following month, the trio of O'Reilly, Cole and Fish was officially dubbed "The Undisputed Era". On the September 20 episode of NXT, O'Reilly and Fish defeated Tyler Bate and Trent Seven due to interference by Adam Cole. On the October 4 episode of NXT, after Roderick Strong's match with Drew McIntyre, The Undisputed Era walked out and patted Strong on the back. On the October 25 episode of NXT, The Undisputed Era gave Roderick Strong an Undisputed ERA armband, with Cole telling Strong that he is "not a loser" and offering him a position in their group. On the November 1 episode of NXT, The Undisputed Era attacked both SAnitY and The Authors of Pain during their match and it was announced that The Undisputed Era would be involved in the WarGames match at NXT Takeover: WarGames. On the November 8 episode of NXT, O'Reilly and Fish interrupted Roderick Strong vs. Adam Cole, leading to a massive brawl among the WarGames teams. At NXT TakeOver: WarGames, The Undisputed Era defeated SAnitY and the team of Roderick Strong and The Authors Of Pain to win the first War Games match in over 17 years. On the December 20 episode of NXT, O'Reilly and Fish defeated SAnitY to win the NXT Tag Team Championship. At NXT TakeOver: Philadelphia, The Undisputed Era defeated The Authors of Pain to retain the titles. At NXT TakeOver: New Orleans, The Undisputed Era defeated Roderick Strong and Pete Dunne and The Authors of Pain to retain the titles and win the Dusty Rhodes Tag Team Classic after Strong turned on his partner and joined Undisputed Era. At NXT TakeOver: Chicago II, O'Reilly and Strong defeated Oney Lorcan and Danny Burch to retain the titles. On the June 19 tapings for the second annual United Kingdom Championship Tournament, O'Reilly and Strong lost the titles to Moustache Mountain (Tyler Bate and Trent Seven), but won them back two days later. At NXT TakeOver: Brooklyn 4, O'Reilly and Strong defeated Moustache Mountain to retain the titles. After the match, The War Raiders (Hanson and Rowe) attacked Strong and O’Reilly. On the November 14 episode of NXT, O'Reilly defeated Hanson, meaning Undisputed ERA would have an advantage in numbers in the WarGames match at NXT TakeOver: WarGames II. Greenwood has type 1 diabetes. He cites Bret Hart, Toshiaki Kawada, Royce Gracie, and Muhammad Ali as his role models. Growing up, Greenwood participated in several sports, including amateur wrestling, ice hockey, football, lacrosse, kickboxing, Jiu-jitsu, and snowboarding, and briefly played rugby in Europe. He remains part of a rugby club. While training to become a professional wrestler, he worked as a cook at a local restaurant. Greenwood once lived with Davey Richards and Tony Kozina. Kyle O'Reilly made his video game debut as a playable character in WWE 2K19. 1 ^ Fish and O'Reilly originally won the title as a duo, but Strong also became recognized as champion under the Freebird Rule after Fish suffered an injury. ^ a b c d Johns, Fred (November 21, 2010). "Kyle O'Reilly's long journey ends with ROH deal". Slam! Sports. Canadian Online Explorer. Retrieved December 7, 2010. ^ a b Laprade, Patric (February 20, 2014). "Kyle O'Reilly a champ heading into ROH 12th anniversary show". Slam! Sports. Canadian Online Explorer. Retrieved March 20, 2014. ^ a b c "ECCW Roster: Kyle O'Reilly". NWA: Extreme Canadian Championship Wrestling. Retrieved November 28, 2010. 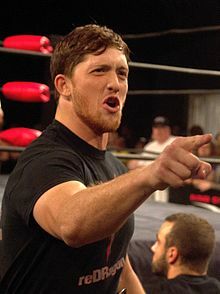 ^ a b "Kyle O'Reilly". WWE. ^ a b c "Kyle O'Reilly". Ring of Honor. Retrieved September 26, 2011. ^ a b c d e f g h "Kyle O'Reilly". Evolve. Archived from the original on December 13, 2009. Retrieved November 28, 2010. ^ a b c d Johns, Fred (June 17, 2006). "The Pain of Graduation Day". Slam! Sports. Canadian Online Explorer. Retrieved November 28, 2010. ^ a b c d e f g h i "ECCW (British Columbia)". Online World of Wrestling. Retrieved November 28, 2010. ^ Johns, Fred (January 31, 2010). "Returning vets revel in ECCW anniversary". Slam! Sports. Canadian Online Explorer. Retrieved November 28, 2010. ^ Johns, Fred (June 5, 2008). "Pacific Cup a showcase of West Coast talent". Slam! Sports. Canadian Online Explorer. Retrieved November 28, 2010. ^ Johns, Fred (November 18, 2007). "ECCW steps up to help fan fight cancer". Slam! Sports. Canadian Online Explorer. Retrieved November 28, 2010. ^ Johns, Fred (June 9, 2008). "Suede not a gracious Pacific Cup winner". Slam! Sports. Canadian Online Explorer. Retrieved November 28, 2010. ^ Johns, Fred (April 6, 2009). "Marathon matches bring in 3,000 pounds for food bank". Slam! Sports. Canadian Online Explorer. Retrieved November 28, 2010. ^ "Detailed Results from Quest for Gold on March 19, 2010". NWA: Extreme Canadian Championship Wrestling. April 10, 2010. Retrieved November 28, 2010. ^ "Detailed Results from Title VS Title on April 10, 2010". NWA: Extreme Canadian Championship Wrestling. April 13, 2010. Retrieved November 28, 2010. ^ "Quick Results – 2010 Pacific Cup – June 6th, 2010 – Vancouver". NWA: Extreme Canadian Championship Wrestling. June 7, 2010. Retrieved November 28, 2010. ^ "Results: Memphis & Powers Win Tag Team Gold, Phantasmo Beats Diaz!". NWA: Extreme Canadian Championship Wrestling. June 28, 2010. Retrieved November 28, 2010. ^ "Quick Results – Live in Nanaimo – June 26th, 2010 – Nanaimo". NWA: Extreme Canadian Championship Wrestling. June 28, 2010. Retrieved November 28, 2010. ^ "Quick Results – Showcase – July 10th, 2010 – Vancouver". NWA: Extreme Canadian Championship Wrestling. July 10, 2010. Retrieved November 28, 2010. ^ Dykens, Brad (January 17, 2009). "DVD Review: FIP "In Full Force" (5/30/08)". WrestleView. Retrieved November 28, 2010. ^ "5.31.08 - Southern Justice 2008". Full Impact Pro. May 31, 2008. Archived from the original on October 9, 2010. Retrieved November 29, 2010. ^ "11.20.09 - Jeff Peterson Memorial Cup Night 1". Full Impact Pro. November 20, 2009. Archived from the original on October 7, 2010. Retrieved November 29, 2010. ^ Dykens, Brad (May 8, 2010). "DVD Review: "Evolve 1: Ibushi vs. Richards"". WrestleView. Retrieved November 28, 2010. ^ "Evolve 2 Results – Spoilers". Evolve. Archived from the original on July 10, 2011. Retrieved November 28, 2010. ^ Radican, Sean (November 15, 2010). "Radican's Evolve DVD Review Series: "Evolve 3: Rise or Fall" 5/1 – Castagnoli vs. Taylor, Fish vs. Hero". Pro Wrestling Torch. Retrieved November 25, 2010. ^ "Evolve 5 Results – Spoilers". Evolve. September 13, 2010. Archived from the original on July 17, 2011. Retrieved November 28, 2010. ^ Radican, Sean (May 19, 2010). "Radican's DGUSA DVD Review Series: "Open the Freedom Gate" – Doi & Yoshino vs. Shingo & Dragon Kid, Yamato-Richards". Pro Wrestling Torch. Retrieved November 28, 2010. ^ Bobo, Thomas (November 29, 2010). "Dragon Gate USA 11/28 results". WrestleView. Retrieved November 28, 2010. ^ Radican, Sean (August 27, 2010). "Radican's DGUSA DVD Review Series: "Fearless" – Hulk vs. Dragon Kid, Mochizuki vs. Richards". Pro Wrestling Torch. Retrieved November 28, 2010. ^ Radican, Sean (March 4, 2010). "Radican's DGUSA "Fearless" PPV Review – Dragon Kid-Hulk, Richards-Mochizuki". Pro Wrestling Torch. Retrieved November 28, 2010. ^ Perry, Matt (September 26, 2010). "9/26 DGUSA results in Milwaukee: Ring arrives and show delivers strong six-man Dragon Gate match, Bryan Danielson's final independent match". Pro Wrestling Torch. Retrieved November 28, 2010. ^ ""Young Lions Cup VIII – Night 2"; 8.28.2010 @ Goodwill Fire Assoc. Hall (Reading, PA)". Chikara. August 28, 2010. Archived from the original on October 17, 2013. Retrieved November 28, 2010. ^ Cambo, Rick. "Chikara Young Lions Cup day two report". Wrestling Observer/Figure Four Online. Retrieved November 28, 2010. ^ Martin, Adam (November 14, 2009). "11/13 ROH Results: Novi, MI". WrestleView. Retrieved November 27, 2010. ^ Martin, Adam (November 7, 2010). "Spoilers: 11/5 ROH HDNet tapings". WrestleView. Retrieved November 28, 2010. ^ Martin, Adam (November 27, 2009). "ROH on HDNet Results – 12/21/09". WrestleView. Retrieved November 28, 2010. ^ Martin, Adam (February 6, 2010). "Spoilers: 2/5 ROH HDNet TV tapings". WrestleView. Retrieved November 28, 2010. ^ Martin, Adam (April 24, 2010). "4/23 ROH Results: Dayton, OH". WrestleView. Retrieved November 28, 2010. ^ Martin, Adam (September 11, 2010). "9/10 ROH Results: Plymouth, Massachusetts". WrestleView. Retrieved November 28, 2010. ^ ""The Pretty Boy Pitbull" Makes It Official". Ring of Honor. September 13, 2010. Retrieved November 28, 2010. ^ Martin, Adam (October 3, 2010). "Spoilers: 10/2 ROH on HDNet TV taping results". WrestleView. Retrieved November 28, 2010. ^ Martin, Adam (October 16, 2010). "10/15 ROH Results: Dayton, Ohio". WrestleView. Retrieved November 28, 2010. ^ Dananay, Jon. "ROH house show results 10–16 Chicago Ridge". Wrestling Observer/Figure Four Online. Retrieved November 28, 2010. ^ Mackinder, Matt (November 9, 2010). "ROH: Edwards defends TV gold against Necro Butcher". Slam! Sports. Canadian Online Explorer. Retrieved November 28, 2010. ^ Bishop, Matt (November 13, 2010). "Edwards wins 2010 'Survival of the Fittest' as ROH returns to Detroit area". Slam! Sports. Canadian Online Explorer. Retrieved November 28, 2010. ^ Gerweck, Steve (November 13, 2010). "11/13 ROH Results: Toronto, Ontario, Canada". WrestleView. Archived from the original on November 24, 2010. Retrieved November 28, 2010. ^ Caldwell, James (December 18, 2010). "Caldwell's Ring of Honor PPV report 12/18: Ongoing "virtual time" coverage of "Final Battle 2010" – Strong vs. Richards, Generico vs. Steen". Pro Wrestling Torch. Retrieved December 19, 2010. ^ Caldwell, James; Radican, Sean (April 1, 2011). "ROH Internet PPV Report 4/1: Caldwell & Radican's "virtual-time" coverage of live ROH PPV from Atlanta". Pro Wrestling Torch. Retrieved July 26, 2011. ^ Caldwell, James; Radican, Sean (April 2, 2011). "ROH Internet PPV Report 4/2: Caldwell & Radican's complete "virtual-time" coverage of live ROH PPV from Atlanta". Pro Wrestling Torch. Retrieved July 26, 2011. ^ Martin, Adam (July 9, 2011). "7/8 ROH Results: Richmond, Virginia". WrestleView. Retrieved July 26, 2011. ^ "Two More Competitors Re-Sign Deals!". Ring of Honor. July 25, 2011. Retrieved July 26, 2011. ^ Namako, Jason (August 14, 2011). "Spoilers: ROH Sinclair TV tapings in Chicago". WrestleView. Retrieved August 14, 2011. ^ Martin, Adam (February 12, 2012). "Indy News #1: NWA Smoky Mountain, !Bang! TV report". WrestleView. Retrieved July 31, 2012. ^ Radican, Sean (March 4, 2012). "Radican's ROH "10th Anniversary Show" iPPV report – live coverage of iPPV from Manhattan". Pro Wrestling Torch. Retrieved March 5, 2012. ^ Namako, Jason (March 31, 2012). "ROH Showdown in the Sun iPPV Results – 3/31/12". WrestleView. Archived from the original on April 2, 2012. Retrieved July 31, 2012. ^ Meltzer, Dave (June 24, 2012). "ROH Best in the World iPPV coverage from New York". Wrestling Observer Newsletter. Retrieved June 24, 2012. ^ Namako, Jason (December 16, 2012). "ROH Final Battle Results – 12/16/12". WrestleView. Archived from the original on December 21, 2012. Retrieved December 23, 2012. ^ a b Carapola, Stuart (March 2, 2013). "Complete ROH 11th Anniversary Show iPPV coverage: two title changes hands, SCUM doubles in size, and a ton of great wrestling as ROH presents their best overall event in years". Pro Wrestling Insider. Retrieved March 2, 2013. ^ "Show Results – 3/30 ROH in Asheville, N.C.: Former WWE star "announces retirement," ROH Title match, more". Pro Wrestling Torch. March 31, 2013. Retrieved December 19, 2013. ^ Caldwell, James (June 23, 2013). "Show Results – 6/22 ROH BITW iPPV in Baltimore, Md. : Briscoe vs. Briscoe for ROH Title, Hardy tops Steen in No DQ match, more". Pro Wrestling Torch. Retrieved December 19, 2013. ^ Caldwell, James (July 28, 2013). "ROH News: New ROH tag champions, Results from Night 1 of ROH Title tournament". Pro Wrestling Torch. Retrieved July 28, 2013. ^ "ROH Spoilers – 9/21 ROH in Philadelphia, Pa.: Results for TV episodes following Death Before Dishonor". Pro Wrestling Torch. September 22, 2013. Retrieved December 19, 2013. ^ Caldwell, James (October 6, 2013). "Show Results – 10/5 ROH in Baltimore, Md. : All titles defended, including impromptu ROH Title match". Pro Wrestling Torch. Retrieved December 19, 2013. ^ Caldwell, James (December 15, 2013). "Show Results – 12/14 ROH "Final Battle" in NYC: Cole defends ROH Title, Hero returns, new TV champ, Hardy, more". Pro Wrestling Torch. Retrieved December 19, 2013. ^ "Show Results – 2/21 ROH Anniversary show in Philadelphia, Pa.: Cole vs. Hero for ROH Title, A.J. Styles, two other title matches, Hardy misses the show, more". Pro Wrestling Torch. February 22, 2014. Retrieved March 30, 2014. ^ Johnson, Mike (March 8, 2014). "New ROH tag Team Champions crowned". Pro Wrestling Insider. Retrieved March 9, 2014. ^ a b Meltzer, Dave (May 17, 2014). "ROH/New Japan Pro Wrestling live coverage & results: AJ Styles, Okada, Elgin, Liger, more". Wrestling Observer Newsletter. Retrieved May 18, 2014. ^ "Show Results – 6/7 ROH in Collinsville, Ill.: Cole defends ROH Title, Tag Title main event, final show pre-BITW PPV". Pro Wrestling Torch. June 8, 2014. Retrieved June 8, 2014. ^ Laprade, Patric (June 23, 2014). "ROH's first live PPV crowned Michael Elgin". Slam! Sports. Canadian Online Explorer. Retrieved June 23, 2014. ^ a b Namako, Jason (November 23, 2014). "Spoilers: 11/22 ROH TV Tapings in Baltimore (Tag Wars)". WrestleView. Retrieved November 24, 2014. ^ Namako, Jason (December 7, 2014). "ROH Final Battle PPV Results - 12/7/14 (Briscoe vs. Cole)". WrestleView. Retrieved March 3, 2015. ^ Martin, Adam (March 1, 2015). "3/1 ROH 13th Anniversary PPV Results: Las Vegas, Nevada". WrestleView. Retrieved March 3, 2015. ^ Namako, Jason (March 28, 2015). "3/27 ROH Supercard of Honor IX Results: Redwood City, CA". WrestleView. Retrieved March 29, 2015. ^ "Show results - 4/4 ROH in San Antonio, Tex. : Major title change & debut (contains spoilers for upcoming TV episodes)". Pro Wrestling Torch. April 4, 2015. Retrieved April 5, 2015. ^ Caldwell, James (September 18, 2015). "Caldwell's ROH ASE PPV report 9/18: Complete "virtual-time" coverage of All-Star Extravaganza - Jay Lethal defends two titles, ANX, more". Pro Wrestling Torch. Retrieved September 19, 2015. ^ Caldwell, James (August 19, 2016). "8/19 ROH Death Before Dishonor PPV Results – Caldwell's Live Report". Pro Wrestling Torch. Retrieved August 19, 2016. ^ a b Keller, Wade (December 2, 2016). "Keller's ROH Final Battle 2016 PPV report 12/2: Cole vs. O'Reilly, Cody Rhodes vs. Lethal, Cabana vs. Dalton, Briscoes vs. Young Bucks". Pro Wrestling Torch. Retrieved December 2, 2016. ^ Johnson, Mike (January 6, 2017). "Contract updates on nine Ring of Honor talents". Pro Wrestling Insider. Retrieved January 10, 2017. ^ "NoDQ.com > WWE > News On WWE Possibly Signing ROH Star". nodq.com. Retrieved 2017-01-11. ^ "First talent announced for PWG's "Steen Wolf," including debuting tag team". Pro Wrestling Torch. September 6, 2011. Retrieved January 24, 2012. ^ "Steen Wolf". Pro Wrestling Guerrilla. October 22, 2011. Retrieved January 24, 2012. ^ "Fear". Pro Wrestling Guerrilla. December 10, 2011. Retrieved January 24, 2012. ^ Ryan, Joey (April 22, 2012). "4/21 PWG results Reseda, Calif.: Super Smash Bros. win DDT4 tag tournament, Steen defends PWG Title in Open Challenge". Pro Wrestling Torch. Retrieved July 31, 2012. ^ Pirrello, Matty; Massingham, Matt (July 22, 2012). "7/21 PWG results Reseda, Calif.: Steen defends PWG Title, three-team Tag Title ladder match, Elgin vs. Callihan, Edwards, Strong, Joey Ryan". Pro Wrestling Torch. Retrieved July 31, 2012. ^ Massingham, Matt (January 13, 2013). "Show Results - 1/12 PWG DDT4 tournament in Reseda, Calif.: Complete coverage of new PWG tag champs, Generico's farewell, more". Pro Wrestling Torch. Retrieved January 13, 2013. ^ Gee Schoon Tong, Chris (August 31, 2013). "Show results - 8/30 PWG BOLA Night 1: Winners of eight First Round matches, plus big six-man tag main event". Pro Wrestling Torch. Retrieved August 31, 2013. ^ a b Gee Schoon Tong, Chris (September 1, 2013). "Show results - 8/31 PWG BOLA Night 2: WWE wrestler/scout attends, who won the Battle of Los Angeles tourney?". Pro Wrestling Torch. Retrieved September 1, 2013. ^ Massingham, Matt (October 20, 2013). "Show results - 10/19 PWG in Reseda, Calif.: Cole defends PWG Title, next challenger set, Steen, Bucks, more". Pro Wrestling Torch. Retrieved October 20, 2013. ^ a b Gee Schoon Tong, Chris (May 24, 2014). "Show results - 5/23 PWG in Reseda, Calif.: Adam Cole loses PWG Title to end lengthy title reign (w/Mike Roe's tweets)". Pro Wrestling Torch. Retrieved May 24, 2014. ^ Massingham, Matt (December 13, 2014). "Show results - 12/12 PWG in Reseda, Calif.: O'Reilly retains, but loses top title in impromptu Guerrilla Warfare match, plus Cole, Joey & Candice vs. Daniels & Kaz, Sabin & Sydal vs. Bucks, more". Pro Wrestling Torch. Retrieved December 13, 2014. ^ "Road to Power Struggle" (in Japanese). New Japan Pro Wrestling. Retrieved November 3, 2014. ^ a b Caldwell, James (November 3, 2014). "ROH/NJPW news: ROH tag champs win Super Jrs. tournament". Pro Wrestling Torch. Retrieved November 3, 2014. ^ a b "Power Struggle" (in Japanese). New Japan Pro Wrestling. Archived from the original on November 11, 2014. Retrieved November 8, 2014. ^ "The New Beginning in Osaka" (in Japanese). New Japan Pro Wrestling. Archived from the original on February 13, 2015. Retrieved February 11, 2015. ^ Caldwell, James (May 7, 2015). "NJPW news: "Best of Super Jrs." tournament details announced". Pro Wrestling Torch. Retrieved June 5, 2015. ^ "Best of the Super Jr.XXII". New Japan Pro Wrestling (in Japanese). Retrieved June 5, 2015. ^ "Best of the Super Jr.XXII". New Japan Pro Wrestling (in Japanese). Retrieved June 7, 2015. ^ a b Meltzer, Dave (August 15, 2015). "NJPW G1 Climax 8-16 live results: Hiroshi Tanahashi vs. Shinsuke Nakamura". Wrestling Observer Newsletter. Retrieved August 16, 2015. ^ "KYLE O'REILLY MAKES HIS NXT DEBUT AT LAST TAPINGS BEFORE TAKEOVER". Wrestling Observer Newsletter. Retrieved July 16, 2017. ^ Zimmerman, Zack. "8/2 Zim's WWE NXT TV Review: Aleister Black in action, NXT Women's Champion Asuka returns, Johnny Gargano vs. Raul Mendoza". Pro Wrestling Dot Net. Retrieved August 2, 2017. ^ Zimmerman, Zack. "8/19 Zim's NXT Takeover: Brooklyn III live review – Bobby Roode vs. Drew McIntyre for the NXT Title, Asuka vs. Ember Moon for the NXT Women's Title, Authors of Pain vs. Sanity for the NXT Tag Titles, homecoming". Pro Wrestling Dot Net. Retrieved August 19, 2017. ^ Johnson, Mike (September 13, 2017). "WWE NXT trio gets stable name". Pro Wrestling Insider. Retrieved September 13, 2017. ^ Williams, JJ (September 14, 2017). "NXT TV taping spoilers: The Undisputed Era continues". Wrestling Observer Newsletter. Retrieved September 15, 2017. ^ Cole, Caitlin (19 December 2018). "Complete WWE 2K19 Roster". Rumble Ramble. Retrieved 24 April 2019. ^ "2012 SoCal Year End Awards". SoCal Uncensored. March 4, 2013. Retrieved August 7, 2015. ^ "NXT Tag Team Championship". WWE. Retrieved December 20, 2017.